Appear at Matsumoto Piano Festival on April 29, 2019. (Koto, Shakuhachi, Shamisen and Mikosuzu) will be given its first performance. 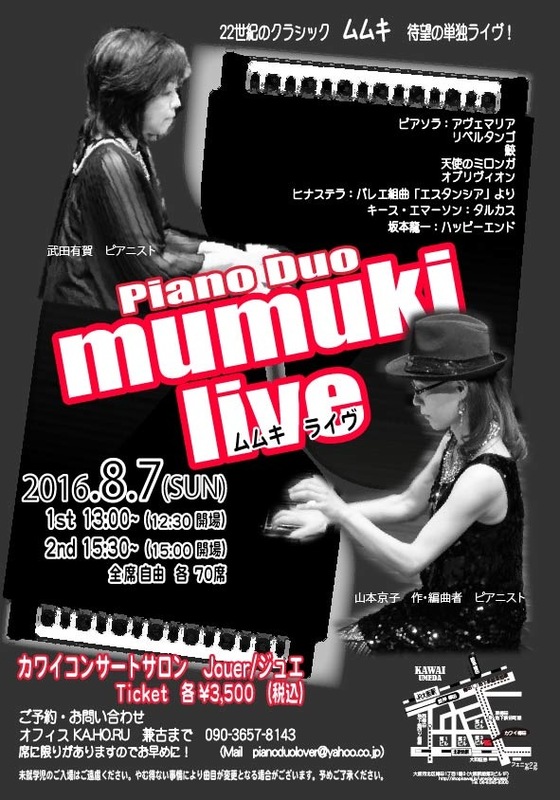 Piano duo Kutrowatz will have concert. [filmmusic] arr. by Kyoko Yamamoto for 2 pianos. Yo-Yo Ma, Kathryn Stott, Sergio Assd, Odair Assd U.S.A.tour in Apr. (scheduled from May 15 to May 20, 2012, in Austria) has been finalized. (composed by Astor Piazzolla and arranged by Kyoko Yamamoto). There were some mistakes on the following score. I am sorry for your inconveniences this may have caused. Please accept my sincere apology and find corrected version below. Kyoko Yamamoto arranged Ryuichi Sakamoto’s works for the best piano duo Kutrowatz. These arrangement works are approved by Maestro Ryuichi Sakamoto. CD[OSTWIND]was released with Maestro Ryuichi Sakamoto’s permission. This arrangement is the revision of [Milonga del Angel] is included in [ASTOR PIAZZOLLA per solo pianoforte vol.2] . Using the following CD for reference, you are able to listen to Kyoko’s arrangement of [Milonga del Angel]. [Oblivion] music by Astor Piazzolla arr. by Kyoko Yamamoto will appear on the stage !! This transcription was written for Yo-Yo Ma (vc) & Kathryn Stott (pf). Yo-Yo and Kathy performed it in their U.S.A. tour in April 2012, and they also will perform it again in Japan Nov. 2012. [Escualo] [Oblivion] [Libertango] [Soledado] [Adios Nonino] etc. [Escualo] [Oblivion] [Ave Maria] etc. Ms. Tali　Morgulis (pianist; http://tali.morgulis.net/) performed [Tango Suite]. The program of klangfruehling 2012 (scheduled from May 15 to May 20, 2012, in Austria) has been finalized. Piano Duo Eduard and Johannes Kutrowatz are scheduled to perform Historie du Tango, Milonga del Angel, and other Astor Piazzolla arrangements on May 19. Click here for the PTNA music of the Week. Click here to see a list of the music contained.